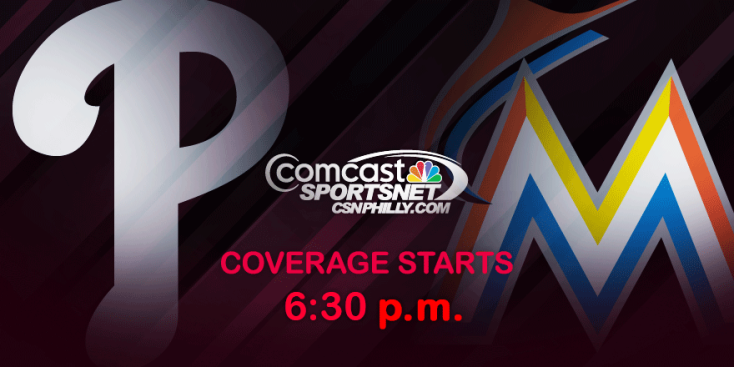 Arguably the Phillies’ most consistent starting pitcher, Jerad Eickhoff takes the mound Thursday night looking to split the four-game series with the Marlins. Who better to turn to than Eickhoff to go for the series split? Eickhoff has arguably been the Phillies' most consistent pitcher this season, posting 12 quality starts in 19 outings. That puts Eickhoff ahead of guys like Masahiro Tanaka and Zack Greinke in quality start percentage. While he may lack elite velocity, Eickhoff simply knows how to locate his pitches — particularly his curveball – and get hitters out. Eickhoff has two career starts vs. the Marlins, giving up three runs in 12 innings with nine strikeouts. Not bad for a guy considered the fourth-best player in the Cole Hamels trade. 2. Chooch’s last home game? This could be the final home game for one of the cornerstones of the 2008 World Series team, and sorry Phillies fans, it’s not Ryan Howard. Will the Phillies trade Carlos Ruiz at the trade deadline? It could happen, according to MLB.com's Jon Morosi. A handful of teams could really benefit from Ruiz’s behind-the-plate experience. It’s not crazy to think a young team in need of a veteran hand to guide the rotation like the Cleveland Indians — with catcher Yan Gomes out up to two months — could take a flier on Ruiz. Hitting .248 with a .352 OBP, Ruiz is no slouch at the plate, either. If Ruiz is traded at the end of the month, it will be the end of an era, but the cowboy hats he gifted the team will live on forever. What happened to Giancarlo Stanton? After winning the Home Run Derby last week, Stanton has just one hit in 12 at-bats this series. Most troubling, Stanton has seen an average of just 3.75 pitches per at-bat. Give it up for the Phillies’ pitching for using Stanton’s aggressiveness against him to keep the slugger in check. Jeremy Hellickson wasn’t the only Phillie being scouted on Wednesday (see story). Jeanmar Gomez also garnered attention from teams, according to a report (see story). And what a show he gave those scouting him, dispatching the Marlins’ hitters in just 10 pitches to close out the game. He doesn’t overpower hitters, but he gets outs under immense pressure, converting 26 of 29 saves. • Marlins starter Tom Koehler is 2-4 with a 3.99 ERA with 26 walks and 58 strikeouts in six career games vs. the Phillies. • After averaging just five hits per game in the first five games post-All-Star break, the Phillies broke out for 12 hits on Wednesday night. • Progress. With two hits on Wednesday, Maikel Franco raised his post-All-Star break batting average from .048 to .120.